Hang your Garden Flags up to 14 inches wide with our Garden Flag Pole with Rubber Stoppers included! 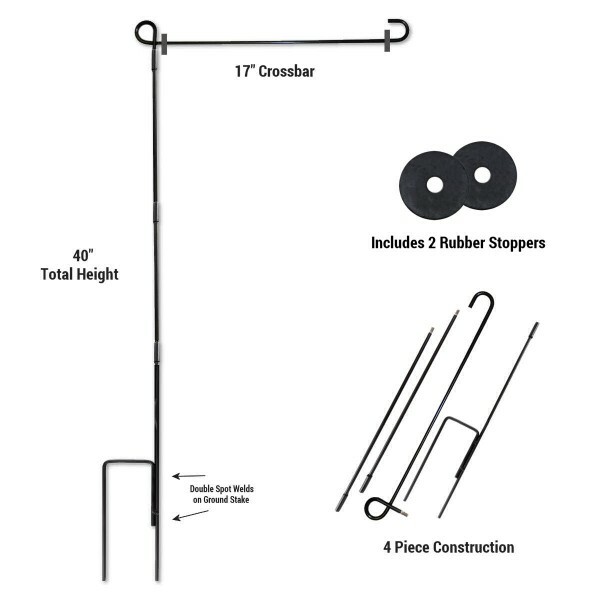 Our weather resistant Garden Flag Pole has an assembled height of 40 inches, a flag crossbar width of 17 inches, and includes two (2) 1.20 inch diameter rubber stoppers to help keep your garden flag secure on breezy days. Additional features include 4-section steel construction so storage is easy and compact. Each section easily screws together so there is no need for a screwdriver or any tools! In addition, the bottom ground stake section is made with double steel welds for extra durability. Our Garden Flag Pole with Rubber Stoppers is powder coated black and is rust and weather resistant.